Joakim Noah is going back to the NBA All-Star Game again, and this time he may try to remember something about the game. Not surprisingly, Noah said in a conference call with Chicago reporters after the All-Star reserve selection announcement Thursday, he couldn’t recall much about the last year’s game. He paused a bit and thought. No, still couldn’t. Probably no surprise. Noah that exhilarating weekend surrounded by buddies from high school and the old neighborhood, “representing,” as he likes to say, for Pops, his father, Yannick, and Mr. (Tyrone) Green, his basketball mentor, admitted he didn’t recall sleeping. Noah recorded 17 points, a season-high 21 rebounds and a team-high six assists in a victory versus the L.A. Lakers on Jan. 20. Noah is the only player in the NBA this season to record at least 15 points, 20 rebounds and five assists in a single game. Proud is perhaps the better description. It wasn’t an expansive Noah on the call as he doesn’t much like to talk about individual exploits, what he did, his achievements. It’s no surprise given the player he has become, selected an All-Star in the vote of Eastern Conference coaches for the second straight season. Noah leads all NBA centers in assists. That’s who he is. He prefers when the other kids enjoy themselves. Everyone has fun when you win. So it’s not about what just you do. The only time Noah really brightened amidst the approximately 10 minutes of a mostly awkward exchange was when Noah talked about bringing his guys back to the game, this time Feb. 16 in New Orleans. “I don’t really remember it too much,” said Noah with a pause. “I don’t remember the game. “I remember my father sitting there with Mr. Green who practically raised me in New York, another father figure,” Noah corrected. “Having both of them there sitting, watching me play in the All-Star game. I was really proud that happened. I know they were proud. That really is Noah. So it perhaps is no surprise how little individuality there is in his game. No one is sure if there could be. But that’s not Noah, anyway. It is a team game to him to the ultimate. He beams in the locker room when Taj Gibson or Jimmy Butler has a big game and you ask him about them. Not that he won’t talk about most everything as we have heard him as eloquent about the game and its meaning as anyone ever in Chicago. There’s no phony in Jo. It is about the team. He plays it on the floor and he lives it off, his Wolfpack the team he’ll be with in New Orleans. No running with the guys with the nicknames and sneakers. It’s typical of Noah that he doesn’t move on and forget the ones who were there with him when no one could have imagined this path. Perhaps Green did, taking in the lanky kid the others called “Frenchie,” and whom they enjoyed for his insouciance and playful nature much more than his game. Mr. Green went to the big summer ABCD camp to work security. He brought along Jo to basically help clean up the locker rooms for the big five star kids, like Dwight Howard. It’s really almost unimaginable to consider he’d be there with them. Forget in the All-Star game among the elite. In the NBA. And even when his University of Florida team won a pair of national championships, Noah dropped to the Bulls at No. 9 in the first round in 2007. And the Bulls pondered long and hard and still longer about whether to select Spencer Hawes instead. And then we remember it all, the dispute with coaches, the suspension extended by his own teammates, his first All-Star weekend appearance not in the awful freshman or sophomore game when so many undeserving “stars” are invited. Jo wasn’t among them. If anything Noah appears to will himself to amazing efforts for his team, like in the memorable 2009 playoffs with all the overtimes, in the Game 7 in Brooklyn last spring, in games in which he had 23 points and 21 rebounds, a triple-double with blocks, which is hardly his strength. Noah is one of nine NBA players this season averaging a double-double with his streak of 17 consecutive double figure rebounding games intact. He’s averaging 11.7 points and 11.4 rebounds. But his 4.2 assists is No. 1 among centers in the NBA. He’s just 15th among centers in blocks, but in the top five among centers in assists, rebounds and steals. Someone asked if he enjoys playing offense more or defense. He facilitates offense, and he loves that. Much more than shooting or scoring. It’s why you never much get Noah to talk about a great game or a great accolade, like an All-Star selection. Or why there won’t be many highlights for him in the game. He prefers all the kids enjoy the game and the day. Which means winning, so he, of course, credited his teammates. Noah also is hardly an All-Star game type player, though the great assist is a big part of the show. Still, Noah probably isn’t lobbing it off the backboard to LeBron James. The starters announced last week were in the East: James, Dwyane Wade, Kyrie Irving, Carmelo Anthony and Paul George. Added were Noah, Roy Hibbert, Chris Bosh, Paul Millsap, DeMar DeRozan, Joe Johnson and John Wall. The talk was about perhaps Lance Stephenson and Al Jefferson being omitted. In the Western Conference, the starters were Kobe Bryant, who probably will be replaced because of injury, Stephen Curry, Kevin Durant, Kevin Love and Blake Griffin. Added were LaMarcus Aldridge, Dirk Nowitzki, Chris Paul, Tony Parker, James Harden, Dwight Howard and Damian Lillard. Tim Duncan didn’t make it and there was sentiment for Goran Dragic. The commissioner names a replacement. If Bryant is out, you can see him selecting the Pelicans’ Anthony Davis. But there was no debate about Joakim Noah. He’s an All-Star in everyone’s eyes. Pretty remarkable, impressive and inspiring. And nothing Noah would ever take for granted. Noah grew up idolizing his friend and schoolyard legend, Lenny Cooke, another future LeBron and Michael whose career crashed. Noah comes from wealth, but he earned his place the hard way by sleeping on Me. Green’s couch while the family summered in Paris. If he was serious about the game he had to prove it and show it. He did. He did it thanks to others, and he lives his life that way. “You can’t take anything for granted,” Noah was saying when asked about basketball but talking about some life lessons as well. “You never know what can happen. A lot of ups and downs; we’ve dealt with a lot of punches thrown at us. We always fought back because this team is resilient. “There’s a long journey ahead,” said Noah. “The second half of the season is going to be no joke. We’re excited. I think we’re getting better every day. I always cherish these moments. To play in the playoffs would be great. 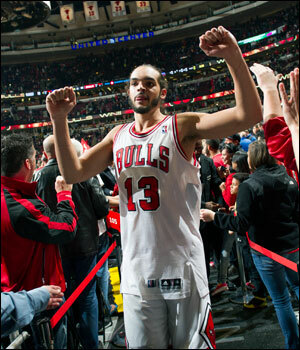 We’re all winners for having been around and enjoying Joakim Noah. Congratulations, Mr. two-time All-Star.